One of the things that’s been long overdue is a sort of John Hughes type film for the LGBT crowd. The sort of coming of age, teen angst film has traditionally been the exclusive territory of straight, white, pretty teens for as long they’ve been made. The LGBT tale has found its way onto the indy scene but appealing to that crowd through the mainstream has been something’s that been missing for a long time. 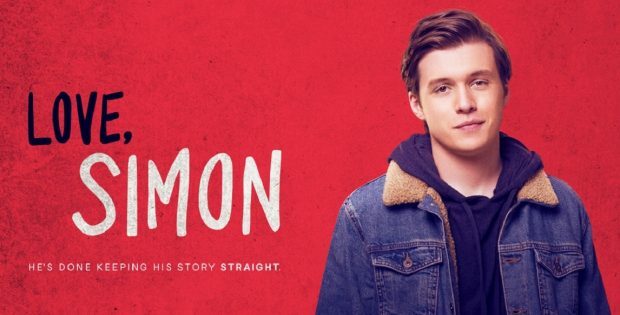 Enter Love, Simon based off the novel of the same name. Simple premise. Simon (Nick Robinson) is a closeted gay kid in suburbia trying to find his moment to be himself. When he gets an email from a fellow gay kid in the closet, who only goes by Blue, they share what it’s like trying to grow up in a far more tolerant era for the LGBT population but still have issues of acceptance, et al, still. A combination of coming of age and “Cyrano,” the film tackles a familiar concept of trying to find out who you are in the middle of one of the most strenuous times of one’s life and adds on the issues that also come with trying to live your life as you see fit. There’s a nuance and emotional depth in the film that’s rare. It’s also relatable; this isn’t a great LGBT film it’s a great film with an LGBT character in it. Nick Robinson is terrific as Simon; we can feel the sort of angst Simon is going through because of everything, and the unsure nature of trying to be who he wants to be, by that the time the film’s requisite happy ending comes around it’s not perfunctory. It’s delightful. In a couple years Love, Simon will hopefully have found the audience on DVD it should’ve found in theaters. There’s a ton of EPK pieces that shed a bit of light into the film’s production.